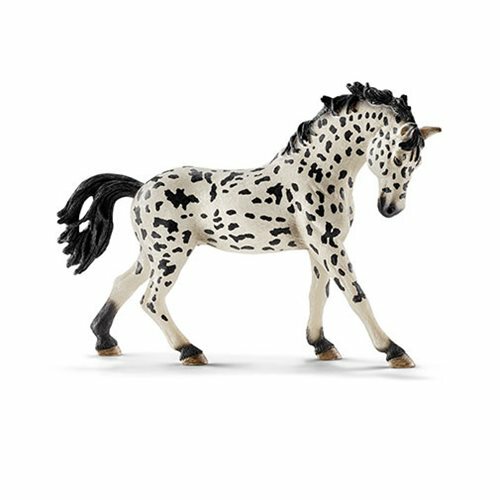 The Knabstrupper is a beautiful and somewhat unique horse, so this very realistic Horse Club Knabstrupper Mare Collectible Figure might be just the thing for you! She measures approximately 6-inches long x 4-inches tall. The dots and spots on the Knabstrupper's coat are as unique as its character. It's full of willpower, highly intelligent, ambitious, and yet calm and good-natured. Therefore, the breed is very suitable as a therapy horse. At the same time, the Knabstrupper can be quite headstrong and stubborn. If you don't deal with it in a determined manner, it will walk right over you! But it's also very loyal and would never leave its owner's side.